It’s 11:30 pm and there’s still enough light to see the snow on the mountains! We’re very excited about our first port of call in Juneau today and our adventure ashore….more on that below. 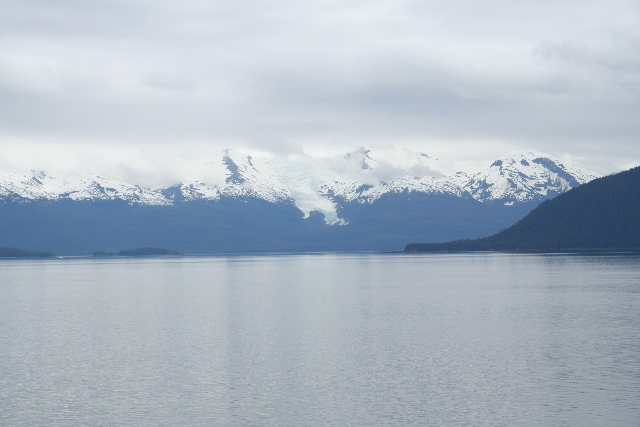 We woke up this morning to a gorgeous scene along Alaska’s Inside Passage. We crossed into Alaska late last night and also gained an hour. 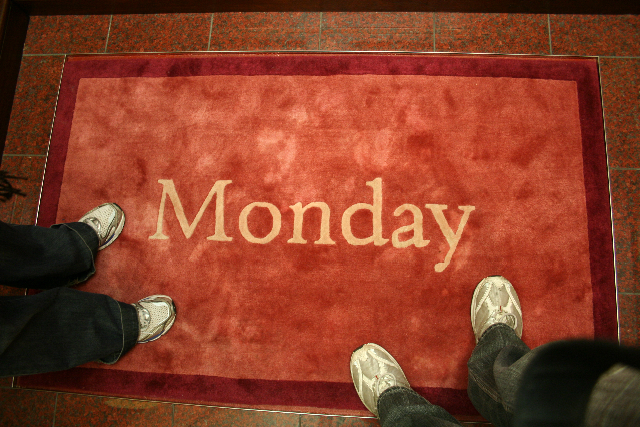 We enjoyed that extra hour by extra sleep. Even though we were up and about by around 9, we somehow missed the humpback whales that were on all sides of the boat around 9:30. Oh well. We’re told there should be plenty of whales to see in Glacier Bay on Wednesday. John led worship for today’s late morning general session where we once again jumped into studying Jesus’ prayer in John 17. During MacArthur’s message ms Statendam docked at Juneau, AK. I sneaked out during the last few minutes to see what was happening and I was so impressed by the docking process. I have a hard time parallel parking my Jeep, I can’t imaging parallel parking a ginormous ship like this! The captain eased the floating mass in little by little until he was within 6 inches of the pier and then dropped anchor. Once the general session wrapped up, we quickly went down to our room to change into comfy clothes and then hit the town. Juneau itself has some interesting buildings, but the most stunning thing about it is its natural setting. 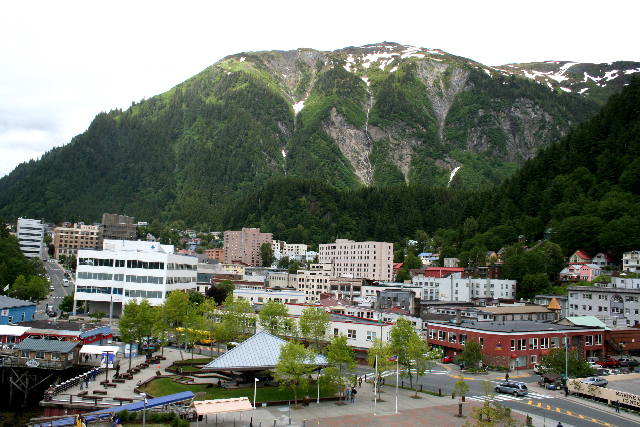 Juneau is Alaska’s capital city and we were told that 60% of the 30,000 people who live there are government employees. Another interesting thing about the city is that there are no roads in or out of the area. The only way to come and go is by plane or boat. It is also the nation’s largest city by square mileage, although the downtown area is actually fairly small. We grabbed a quick sandwich at the cutest little local cafe and then met our party for our big adventure. We climbed on a bus with about 15 other people and drove a lovely scenic route to a heliport outside of town. After a safety orientation and a glacier boot fitting we walked out to the helipad and watched as 4 helicopters landed some 75 feet from us. The workers refueled the chopper we were to take and then motioned for us and the other couple in our group to come board. We climbed in, ladies in the front with the pilot and men in the back and after getting strapped in and set up with headsets, we were off! We flew up and over the most gorgeous and rugged peaks surrounded by snow filled valleys and creek canyons. The 20 minute flight took us over the 12 mile Mendenhall Glacier, up to the very top where there is a dog sled camp. Our pilot pointed to some little black dots below us and said, “That’s where you’re going.” A few moments later we landed on the glacier just outside the camp and were greeted by the mushers. We were all bursting with excitement as we were given a brief orientation and instructions. There are 300 dogs and 30 mushers/handlers at the camp and it is the largest of it’s kind. Many of the dogs had already run in the Iditarod or the Yukon Quest (both races are over 1000 miles) and many of them are just yearlings being trained to race. Each dog had his own little dog house and about a 6×6 ft plot of space. They were split into 10 plots of 30 dogs each and there is a musher and a handler for every plot. The people live in tents on elevated wood floors, sleep in cots and keep warm by propane heaters. There is 1 outhouse in the camp and I’m pretty sure there is no shower anywhere. They do have a kitchen tent and a full time chef. The camp operates during the summer for about 4 months and the staff goes down to Juneau for supplies and such about once a week. The dogs are runners, all they want to do is run, so as soon as a group of tourists land they start barking and pulling on their chains as if to say “Take me! Take me!” They are in perfect shape, like a marathon runner - pure muscle. They aren’t exactly show dogs and so they don’t look anything like what you seen in the movies. The race dog is actually a mix breed of malamute, huskey, pointers, hounds, spaniels, german shepherds and wolves. Each breed was chosen for specific traits and every dog looks different. The race breed is pretty refined now and they are no longer breeding in new types, but it has not yet been recognized as a pure breed by the AKC. We were introduced to our musher, Eric, and handler, Mike, and then walked over to their dogs. They had already chosen 9 dogs and lined them up to hook to our sled. We were introduced to each dog and let them take a moment to check us out. Eric asked us to stand back as they hooked the dogs’ harnesses to the sled and then gave us quick instructions on how to drive. There were 2 sleds attached to each other - Eric drove the front sled and commanded the dogs, while John and I alternated driving the back sled. The with the first command, “Alight, let’s go!” - we were off! Eric took us on a trail about a mile loop over the glacier, stopping twice to let the dogs cool off and let us snap a few photos. The dogs have amazing stamina and strength. 5 in our team had already raced in the Yukon Quest and were going to race again this year. The races are in the winter time in incredible conditions. It wouldn’t be unusual for the dogs to race in temperatures below zero! Eric told us, that the 40∘weather on the glacier felt hot to these rugged dogs. Once back in camp we were given a tour of the camp and got to meet the litter of puppies that were just 3 months old and just starting to be harnessed trained. They were so soft and adorable.! Alright, enough stories….enjoy the pictures! This entry was posted on Friday, June 27th, 2008 at 11:08 am	. You can follow any responses to this entry through the RSS 2.0 feed. You can leave a response, or trackback from your own site. Wow, that dog sledding sounds like SO much fun!!! I sure enjoy keeping up with you guys through your blogs. I’m going to get your Resolved CD! I’ll let you know what I think. Wow! That’s amazing! Chad and I were just saying that we’d love to go on a dog sled someday!! I love the gorgeous scenery shots too! Glad you guys are having a wonderful time!